At the intersection of Tools, Art and Craft: moving your photography to art. We invite you to explore the celebration of spring in the lower Owens Valley. This workshop provides a great opportunity to develop your personal style, enhance your creativity, refine your photographic vision and improve your technical proficiency as we explore the unusual formations the Trona Pinnacles towering tufa spires, Ballarat Ghost Town with it’s dramatic mountain backdrop, the wildflowers among the canyons of the Eastern Sierra foothills, the spectacular lava flow of Fossil Falls, the scenic cliffs and buttes of Red Rock Canyon, the living ghost town of Randsburg, and a chance to photograph blooming Joshua Trees. Our journey to Lower Owens Valley is bound to capture many stunning images of unique locations, most of which are off the beaten path and rarely photographed. Day 1 - Sunday: Meet in Ridgecrest, California at 4:00 p.m, please arrive promptly, for orientation and our first lecture. 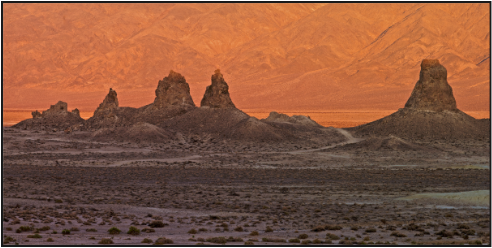 Day 2 - Monday: We leave early for our sunrise shoot of the Trona Pinnacles. We will return to Ridgecrest for breakfast and break. At 11:00 a.m. meet for our second lecture followed by a break for lunch. After lunch we leave for our afternoon and sunset shoots in Ballarat Ghost Town. Day 3 - Tuesday: We leave early for our sunrise shoot of canyons of the Eastern Sierra foothills including Short, Grapevine and Sand Canyons. We will return to Ridgecrest for breakfast and break. At 11:00 a.m. we meet for our third lecture, followed by a break for lunch. After lunch we travel to our afternoon and sunset shooting of Fossil Falls. Day 4 - Wednesday: We leave early for our sunrise shooting at Red Rock Canyon State Park, then return to Ridgecrest for breakfast and break. After the break we begin our Print Review of participants' work followed by a lunch break. Our afternoon shoot will be at Burro Schmidt’s Tunnel, Randsburg and Last Chance Canyon. Day 5 - Thursday: We begin our last day with a sunrise shoot at a Joshua Tree Forest. We return to Ridgecrest for our last breakfast and the workshop will conclude. Our workshops emphasize field work, however we feature a balance of field work, classroom-based sessions, critical review of your work as well as ample time to answer your questions. This workshop features classroom instruction and reviewing workshop participant's images. Day 1: 4:00-6:00 p.m Tools - mastering your system. The session begins with an overview of light, color and perception. It is followed by new approaches to designing a photograph using the FAST methodology, using camera controls effectively, selection of lenses, depth of field and exposure. Day 2: 11:00-1:00 p.m Art - taking your photography to art. The session begins with the interaction of aesthetics, art and technology: how to use and break the rules effectively. CTF2 - composition, color, tone, texture, form and frame: a model for thinking about your work. Day 3: 11:00-1:00 p.m Craft - workflow and presentation of your work. The session begins with a tour of "workflow" and we present a simple approach to processing your images. It is followed by a review of using color management effectively and a discussion about preparing your images for presentation on displays, the web and the "fine art" print. Day 4: 11:00-1:00 p.m Review - what makes a great photograph? During this session we review and comment on your work. Please bring 3 prints of your 'best' work for evaluation, critical review and sharing with the group. The workshop is open to all photographers with any experience level from beginner to advanced, using any camera brand or type, digital or film. Your instructors are well versed in the use of Canon, Hasselblad, Leica and Nikon systems as well as point and shoot, digital single lens reflex, rangefinder, medium format and sheet film based view cameras (i.e., 4x5). This workshop is targeted at photographers working in digital capture and using a personal computer and software such as Apple iPhoto, Apple Aperture, Adobe Lightroom or Adobe Photoshop. We recommend a digital SLR with interchangeable lenses (with either a full-frame or cropped sensor), a sturdy tripod and ball-type head, a shutter-cable release, and at least two lenses: a wide angle lens and a telephoto lens (or a zoom lens capable of wide angle to telephoto range). Check out our equipment recommendations to learn more about our suggestions. Some workshop participants have previously even used their iPhone as their primary camera on the workshop! Your equipment should never be a limitation for expressing yourself through photography. Well crafted, compelling and emotional artistic images can be captured with virtually any equipment. The weather in Lower Owens Valley in mid April can be mild and beautiful. Temperatures around Ridgecrest during the day average of 75 F and 45 F at night. Our elevations range from 1,079 feet to 3,500 feet. The key is to be prepared for a wide range of weather conditions and temperatures, bring layers and an outer layer suitable for rain or snow. Hiking boots are the best choice for footwear. Bring plenty of water and snacks during our location shooting. Consult our gear checklist to learn what we recommend that you bring. Workshop participants are responsible for their own lodging, meals and transportation. The town of Ridgecrest features many lodging choices that can be found at the Ridgecrest Hotels, Motels - California CA - Ridgecrest Hotel Discounts website. We will often eat meals together, however you are free to join us or eat independently. A vehicle with high ground clearance and 4WD is required for this workshop. Car pooling is recommended during our outings and is a great way to get to know your fellow workshop participants, share your passion for photography and learn new points of view. Workshop participants are responsible for any fees for parking, park entrance and park usage. The workshop will be led by veteran photographers Glenn Edens, Norine Cepernich and John Bassetto. There will be a maximum 4 to 1 student to instructor ratio to insure you have the time, attention and individual assistance you need to learn and practice concepts. Our top priority during the workshop is to help you shoot. While we may bring camera equipment for demonstration purposes, your instructors do not shoot during the workshop. The cost of this workshop is $995.00. The workshop is limited to 12 participants. A detailed agenda, overview maps and locations of meeting places will be sent to you via electronic mail about one week prior to the start of the workshop. A confirmation email, verifying your participation in the workshop, is sent to you within two days after receipt of payment. To sign up simply follow the instructions on our Workshop Store and please read the Terms, Conditions & Limitation of Liability information. Our goal is to provide you with an educational, enjoyable and high quality photographic workshop experience. As a workshop participant you will need to understand, agree to, sign and date a Limitation of Liability form.